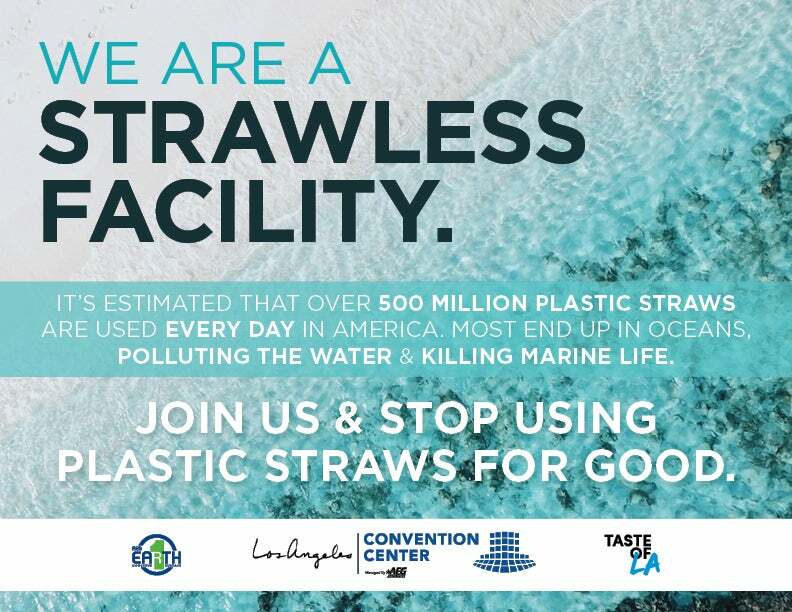 LOS ANGELES (November 13, 2018) - The Los Angeles Convention Center (LACC), owned by the City of Los Angeles and managed by AEG Facilities, announced its straw ban during a sustainability presentation at the National League of Cities (NLC) City Summit on November 9, 2018. The United States uses over 500 million plastic straws every day; most straws end up polluting oceans and killing marine life. 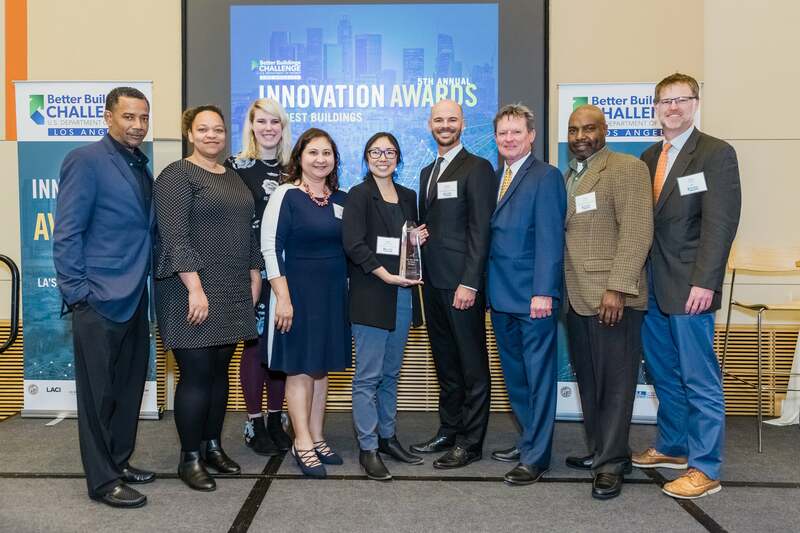 The LACC, in partnership with in-house caterer Taste of LA by Levy Restaurants, will cease the use of 250,000 straws annually to protect the planet. Paper straws will be used only for blended coffee beverages until other solutions are accessible. Paper straws will also be available for those with ADA requirements. 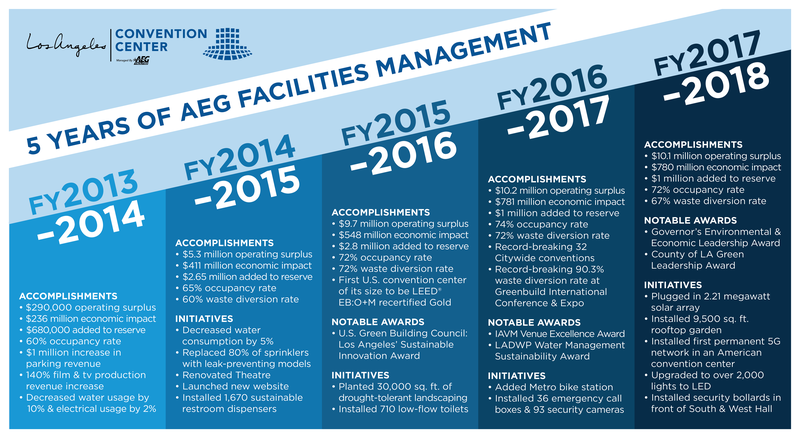 The LACC has recently implemented additional sustainability initiatives. In August the facility upgraded to water and energy efficient dishwashers, saving an estimated 1.3 million gallons of water annually. Last month the LACC started a project replacing 330 faucets in guest restrooms; 0.5 gallon per minute (GPM) faucets are being upgraded to 0.35 GPM units, which will save approximately 415,000 gallons of water annually. The Los Angeles Convention Center (LACC) is renowned internationally as a prime site for conventions, trade shows, and exhibitions. Owned by the City of Los Angeles and professionally managed by AEG Facilities, the LACC attracts over 2.5 million visitors annually. The facility is an integral economic component to the Southern California area, generating economic benefits through attendee direct and indirect spending and sustaining over 12,500 local jobs. The LACC also remains an enduring symbol of environmental sustainability and social responsibility, and is proud to be a LEED® Gold certified facility; the venue was recertified on the Gold level in 2015 making the LACC the first convention center of its size in the U.S. to receive LEED® EB:O+M Gold recertification. For more information, please visit lacclink.com. AEG, a wholly owned subsidiary of the Anschutz Company, is the leading sports and live entertainment company in the world. AEG Facilities, a stand-alone division of AEG, and its affiliates owns, operates or consults with more than 150 of the industry’s preeminent venues worldwide, across five continents, providing complete venue management, as well as specialized programs in operations, guest services, ticketing, booking, sales and marketing. AEG Facilities also provides resources and access to other AEG-affiliated entities, including AEG Live, one of the largest live music companies in the world, AEG Global Partnerships and AEG Real Estate, as well as such industry leading programs as AEG 1EARTH and AEG Encore to support the success of its venues across the globe. The Los Angeles-based organization owns, operates or provides services to the world’s most elite venues, including STAPLES Center and Microsoft Theater (Los Angeles, CA), StubHub Center (Carson, CA), Sprint Center (Kansas City, MO. ), Valley View Casino Center (San Diego, CA), KFC Yum! Center (Louisville, KY.), American Airlines Arena (Miami, Fla.), Prudential Center (Newark, N.J.), Barclays Arena (Brooklyn, N.Y.), Target Center (Minneapolis, MN), Oracle Arena and O.co Coliseum (Oakland, CA), CONSOL Energy Center (Pittsburgh, PA), Mercedes-Benz Arena (Shanghai, China), MasterCard Center (Beijing, China), The O2 Arena (London, England), Mercedes-Benz Arena (Berlin, Germany), Barclaycard Arena (Hamburg, Germany), AccorHotels Arena (Paris, France), SSE Hydro (Glasgow, UK), Qudos Bank Arena (Sydney, Australia), Perth Arena (Perth, Australia), Ericsson Globe Arena (Stockholm, Sweden), Los Angeles Convention Center (Los Angeles, Calif.), Hawaii Convention Center (Honolulu, HI), Puerto Rico Convention Center (PRCC), Brisbane Convention & Exhibition Centre (Brisbane, Australia), International Convention Centre (Sydney, Australia) and the Oman Convention and Exhibition Center (Muscat, Oman). For more information, please visit aegworldwide.com.